In January I wrote a post, My Semester in Review: The People & Things That Have Inspired Me, reflecting on my fall semester, a series of four months full of experiences that have profoundly impacted my life–namely my identities as a scholar, a white ally, a culturally relevant and responsive pedagogue, and a media literacy educator. I’ve been meaning to do a follow up for a few months but every time I sat down to write, I had a difficult time pinpointing what it was that I wanted to share. I’ve now had some time to step back and truly see my second year, working to situate and understand it in the larger contexts of both my personal life and my life as an academic, and the thing that ties it altogether is this: hip-hop. People define hip-hop in different ways based on their personal relationships to it. As Dr. Chris Emdin explains, “Everybody’s an expert in hip-hop based on their own unique relationships to the culture and the music.” I have been interested in hip-hop culture for many years and as a media literacy educator, I often use hip-hop texts in deconstruction and critical thinking exercises and in striving to engage in culturally relevant practices. While I have studied the Golden Era since college, and developed a deep passion and respect for the culture and music–in awe of hip-hop as a sociocultural, historical and political movement–I’m still an “outsider” in many respects, still learning my place in a space that overlaps with many of my other research and personal interests (e.g. media literacy, critical pedagogy, sociology, urban education). But, since attending the Preemptive Education Conference in September 2012, I have developed a new relationship with hip-hop; a new lens through which to view and use hip-hop. Over the course of the last year, I’ve seen the intersections of hip-hop and education come to life. I saw it in Chris Emdin’s class, “Hip-Hop, Cultural Studies, and Urban Science Education;” I saw it in the planning of Science Genius (video below), and the incredible music that students produced; and I saw it in my own work–collaborating with my friend and colleague Ian Levy in practical research on media literacy, hip-hop education, and socioemotional health. I began to delve deeper into the theory and practice of hip-hop education as I simultaneously began a one-year teaching position at a charter school in Harlem last September, offering a media arts elective class to 5th and 6th grade students, all students of color. Now, it is wrong to assume that just because you are teaching youth of color in an urban school means that they all like and listen to rap and/or hip-hop. Even though it’s likely that most do, it is almost irrelevant. The pedagogy behind hip-hop education is rooted in the necessity of acknowledging, incorporating, and celebrating the culture, history, and everyday experiences of the youth you are teaching. People who know hip-hop are familiar with the four elements (MC-ing, DJ-ing, B-boying, and Graffiti)–much of Emdin’s work revolves around his translation of the four elements into best practices for teachers–but there is a fifth element that is the most important, yet least discussed: knowledge of self (KOS), an idea introduced by the Five Percenters in the 1980s, and still highly relevant in current conversations about improving urban education. KOS requires one to think of the self as collective, to understand one’s context and one’s history, and to constantly engage in identity work. Throughout the year, I felt like there were more days that fell short of my expectations, or days that I had fallen short in my planning and execution of a lesson or production activity. But when I reflected with my students on the last day of class (and in the weeks since), I realized how much we accomplished: We deconstructed mainstream hip-hop lyrics; learned about the sneaker industry, sneaker head culture, and designed our own sneakers as a medium for storytelling; we learned about spoken word poetry and were visited by a spoken word artist and two “conscious” hip-hop artists who shared their work and worked with my young people to write their own lyrics and imagine beyond the boundaries of classroom learning. 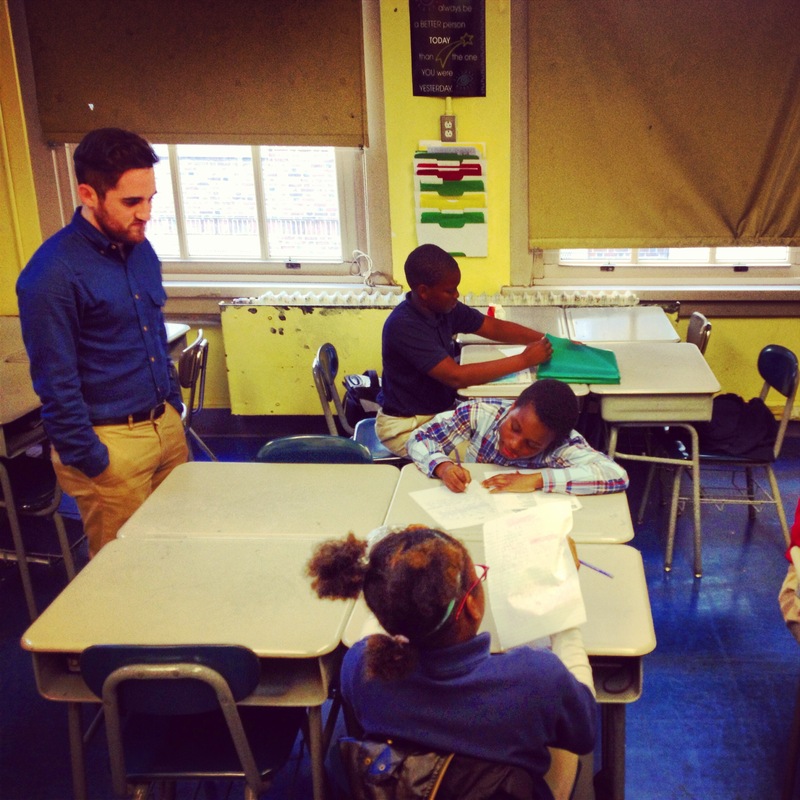 Although much of the content that we covered would be classified as “hip-hop,” it is more important to recognize what the content represents–how it reaches the students, allows them to share their lived experiences and strengthen their knowledge of self–and how we as educators can begin to re-imagine learning spaces. After all, “…hip-hop speaks to those lowest on the totem pole…[it] helps the subaltern to be brought up and become empowered” (Emdin, 2013, class notes). While I got so much out of my teaching experience, I quickly noticed stark contrasts between what was happening in my classroom versus what was happening throughout the rest of the school, namely the lack of respect and civility exercised by the teachers towards their students. 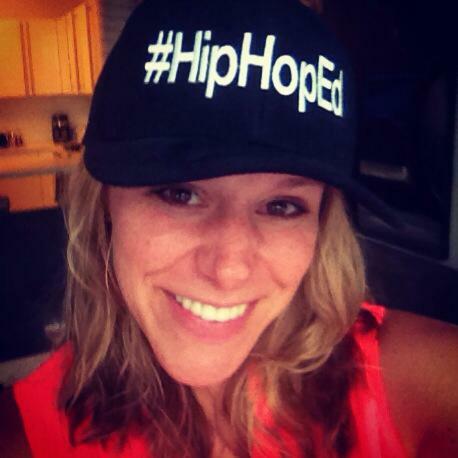 It became increasingly difficult to observe and I desperately needed an outlet to work through challenging realities and realizations, which is when I got involved with #HipHopEd. Yea, a hash-tag. Nine characters that represent a never-ending conversation and an incredible community of scholars, activists, experts, and hip-hop heads that have had an incredible impact on me this year. #HipHopEd is an online, collaborative space where we critically analyze, constructively debate, and cooperatively brainstorm about how to better reach and engage youth (particularly urban youth of color) in and out of classroom spaces. Every Tuesday night from 9-10pm, people from across the country (often people from Canada and London too) gather via Twitter to talk about an issue or topic related to hip-hop. Topics have included, “What’s Hip-Hop’s role in Dismantling the School to Prison Pipeline?”, “The Impact of Gender & Race on the Implementation of Hip-Hop Education – White Female Teachers”, and “Foundation Series Part 5 – Knowledge of Self“. Engaging in these weekly chats has provided me with unique access points through which to join in on conversations about hip-hop in unprecedented ways. It has given me a platform to talk about hip-hop in ways that I feel confident, primarily through its intersections with education and with popular culture. And most importantly, members of the hip-hop community and hip-hop generation (predominantly men–and women–of color) have welcomed, supported, and validated me a member of this community. It may sound silly to those who are unfamiliar with Twitter, but getting retweeted, favorited, or replied-to by people who I deem important and hold in high esteem is big. I now have contacts across the country (most of whom I have never met, some who I will never meet) who I consider to be friends and colleagues (shout outs to @tdj6899, @amilcook, @husslington). While Jay-Z’s new album or Obama’s comments on the Zimmerman ruling might be the week’s topic, the conversations always tie back to what we, as hip-hop educators advocating for culturally relevant and responsive pedagogy, can do to best support and empower our students (in my case, I am often thinking more about how I can work with other teachers and educators to better understand what hip-hop is and why it is important). And most recently, Jay-Z’s statement that his “presence is charity,” and Don Lemon’s shaming and criticism of the Black community. While my failure to write has largely been due to a new summer work schedule, it was also a result of an internal conflict that I’ve been having with how to critically analyze these situations while also being aware and respectful of my positionality. As mentioned in previous posts, I have found an amazing community of people of color and other whites allies who have worked with me to foster my own identity as an ally and have helped me to grow as an anti-racist, socially just, and culturally relevant educator. But just because I have found a safe space in which to engage, doesn’t always mean that I know how to tackle certain topics or that I have a “right” to (and I seriously respect that), but it also doesn’t mean that I throw in the towel and disengage either. I bring this up to note that while I have started to identify myself as “hip-hop” in how I live, how I educate, and how I think, the reality is that there are some aspects of hip-hop culture and education that I will never be able to access; certain experiences that I will never understand. But again, I’m not deterred by this; rather, I’m humbled by the ways in which I am able to be involved and contribute to the work. My role as a hip-hop educator, my identity as a white ally, are works in progress and are integral parts of my larger journey as a scholar and engaged and socially just person. And If there’s one thing that I hope you take away from this post, it’s the understanding that the first things you should associate with the term “hip-hop” are identity, culture, history, and education. Then the music. Thanks for reading and commenting!!! 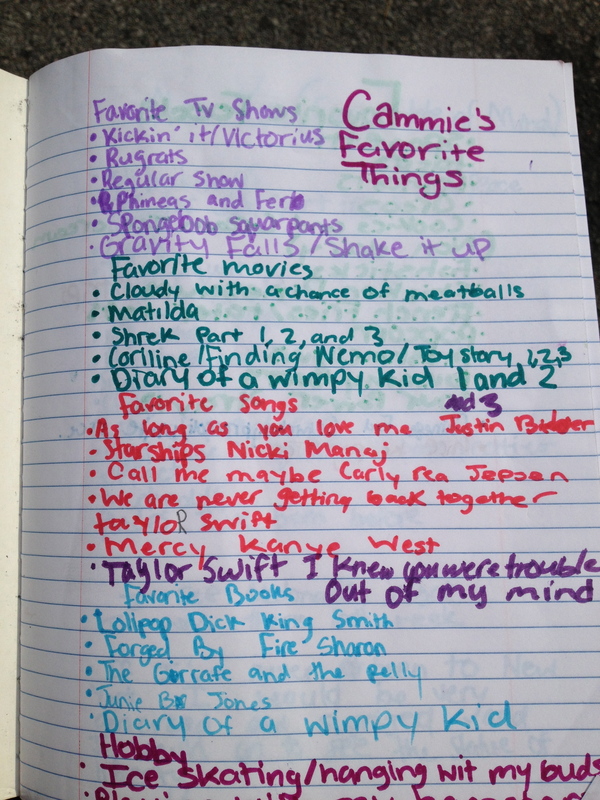 And yea, the chirp stories are an amazing way to document for those who can’t make the chats! You need to start joining in on them!